Jackolantern wrote: Very nice again! And one question: Are you building this with a planned game in mind you are wanting to make with it? Or is the end goal of your project the engine itself? Thank you. There are ideas for games floating around my head, and a slightly more concrete idea for the first game to make on the engine, but the end goal of this project is an engine that can do whatever I need it to do to make whatever I want to make. Eventually I would like for Driftwood to be a very cinematic engine. Switch to Universal Binary JSON for the database format. Beginnings of support for occlusion. Loading and rendering times are heavily reduced. 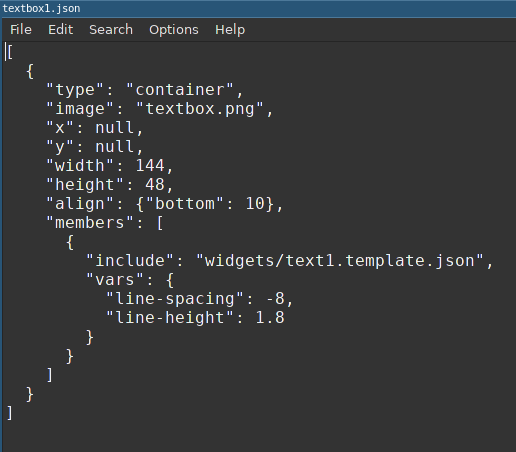 STDLib support for loading and inserting widgets from descriptor files called Widget Trees, which currently support Jinja2 templating with variables, includes, and multiple layers of container widgets. In addition to the usual bugfixes, this release's major features are lazy map loading and more complete graphical occlusion which speed things up significantly, especially for large areas, as well as a more complete widget tree description language which supports things like newlines and relative positioning. 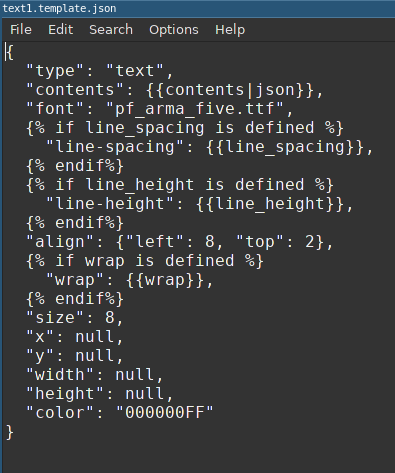 Entity descriptors now also support Jinja2. Quick question: You may have already answered this somewhere in this thread, but are you planning on releasing this engine to the public? Jackolantern wrote: Quick question: You may have already answered this somewhere in this thread, but are you planning on releasing this engine to the public? It's on GitHub! It's already public and open source. And the Alpha-0.0.10 Windows 10 binary is ready. Oh sweet! I see you mentioned that in your first resurrection post. Not sure how I missed that! Apart from a few smaller feature additions, this release is mostly about restructuring the project. Two new API libraries were created -- Folkdance and Stageshow. Folkdance is a reference library which will mostly handle advanced entity-entity, entity-player, and entity/player-world interactions. Currently it contains an InventoryManager and a PlayerManager. Stageshow is a special effects and choreography library. Stdlib was dissolved, some of its functions moved into the core engine and others into the aforementioned new libraries. In addition, the testing worlds, libraries, and documentation were split into submodules. Note that this means extra steps are necessary to collect everything together to build from source, so a Linux binary release is included. This release gives the Makefile the ability to generate releases. There is now a __common__ directory inside the data directory. Libraries placed in this folder are automatically added to the data path at startup. Stdlib was initially moved from the source directory to here, but then it was replaced by Folkdance and Stageshow. JSON schemas were consolidated into strings in a Python file to defeat a complication when building on Windows. The underscore character is now a shortcut for accessing temporary variables in the engine. Instead of Driftwood.vars["variable"], you can now reference _["variable"]. It is now possible to append or prepend path segments to the config file's path from the command line, instead of only being able to replace it. InputManager now has contexts, so that for example you can have different keybindings for menus than for player control. 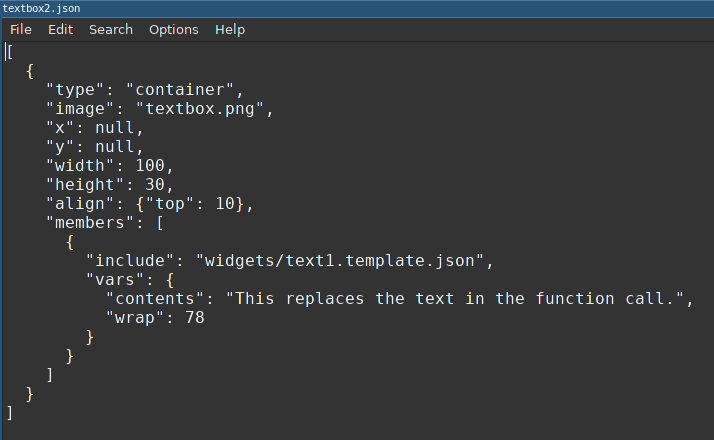 Widget Tree handling was moved to the core engine, and resides in widgettree.py. The engine now sets its working directory to the directory of the config file you are loading. And of course, there were many bugfixes. Congrats on the release. Very inspirational project. Lots of work and it shows in the product.